Hi friends ! 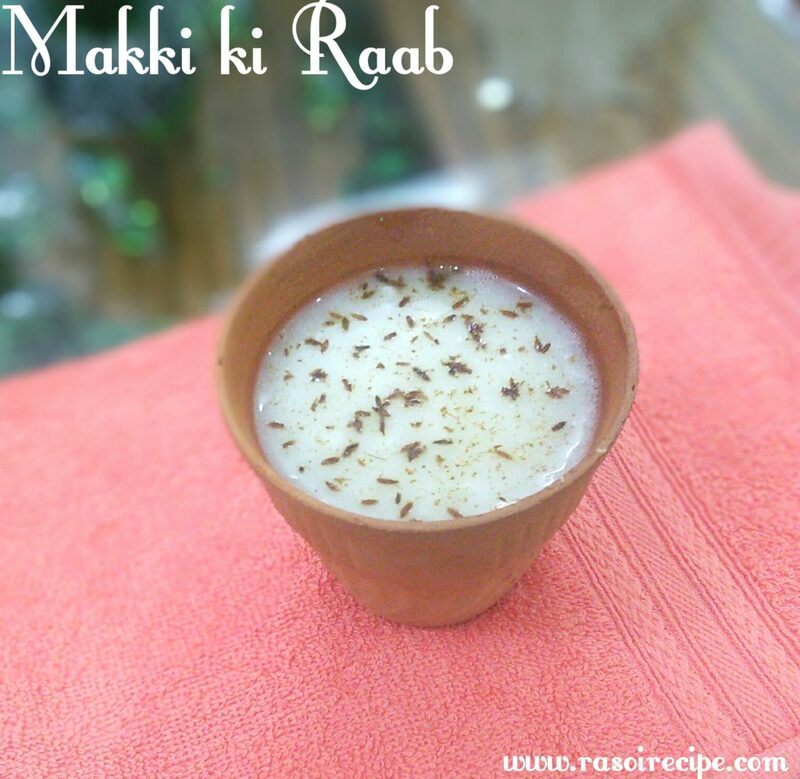 Today’s recipe is ‘Makki ki Raab’. 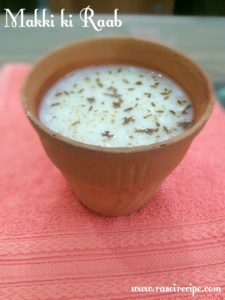 It is one of the most popular and loved winter drink from Rajasthani cuisine. Makki raab is an unique beverage. 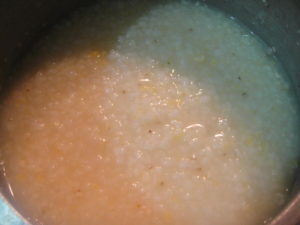 Raab is made from broken corn and buttermilk (chaach)/curd. For this recipe, buttermilk which is one or two days old is preferred. It is a hot beverage which is tangy in taste. 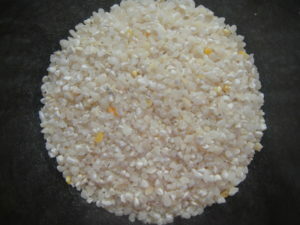 Traditionally, it is served in kulhads / earthen ware. During winter season in Rajasthan, this drink is in the menu list of most of the fairs and weddings. 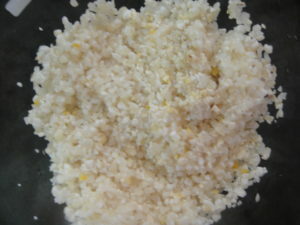 You can share your re-creation of this recipe or any other recipe from RasoiRecipe. You can share it on Facebook page or directly mail it to me on rasoirecipe@gmail.com . I would love to hear from you guys. If you have any suggestions or if you want to share your views or appreciation, you can leave your message in the comment section below. Wash and soak broken corn for half an hour. In a pressure cooker add water, salt and soaked broken corn. Close the lid and cook for 5 minutes on high flame and for next 25 mins on lower flame. Check whether the broken corn is tender or not, when pressure drop. 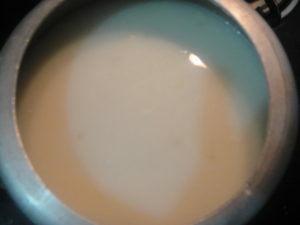 In the pressure cooker now add buttermilk. Keep continuously stirring it, do not leave. Give it a boil. Garnish the raab with roasted and crushed cumin seeds. Serve raab hot ! If you do not have buttermilk/chaach, use curd. 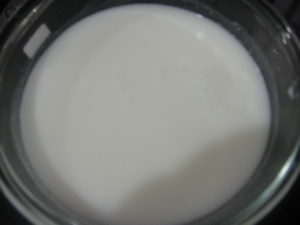 Add water in the curd to have buttermilk like consistency. You can also store this drink in referigerate and have it on next day. Microwave or warm it for few minutes. I heard this recipe first time. looking so nice.thanks for sharing it. such an easy recipe. nice post.. i love your recipes. I am so happy to know that you liked this recipe. I am so happy that through this blog, I am able to introduce various sides of Indian food to you. Appreciation and love from talented people like you motivates me everytime.